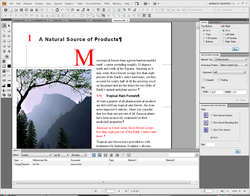 Adobe FrameMaker is a document processor for the production and manipulation of large structured documents. It is produced by Adobe Systems. FrameMaker maintains a strong following among professional technical writers. FrameMaker has more or less kept up with the times in supporting new standards such as XML and WebDAV, but at heart it is a proprietary single-desktop-oriented system based on a binary file format. While problems exist in FrameMaker's XML implementation, the application supports authoring in an XML-based workflow.